This flaky and light pie crust will be a welcomed addition to those who have adopted a gluten-free lifestyle. 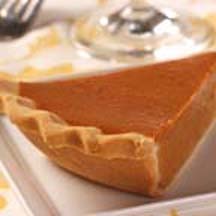 Now you can enjoy the great taste of Libby's® famous pumpkin pie filling with a gluten-free crust. For Filling: Mix sugar, salt, cinnamon, ginger and cloves in small bowl. Beat eggs in large bowl. Stir in pumpkin and sugar-spice mixture. Gradually stir in evaporated milk. Pour into pie shells. Bake in preheated 425°F (220°C) oven for 15 minutes. Reduce temperature to 350°F (175°C); bake for 40 to 50 minutes or until knife inserted near center comes out clean. Cool on wire rack for 2 hours. Serve immediately or refrigerate. Top with whipped cream or topping before serving. 3 1/2 teaspoons pumpkin pie spice may be substituted for the cinnamon, ginger and cloves; however, the taste will be slightly different. This dough is easiest to roll and work with when used soon after preparing it. Do not freeze pies, as this will cause crust to separate from the filling. Nutritional Information Per Serving (1/16 of recipe): Calories 290; Calories from Fat. 80; Total Fat 9g; Saturated Fat 6g; Cholesterol 95mg; Sodium 280mg; Carbohydrates45g; Dietary Fiber 3g; Sugars 25g; Protein 6g.